Safety Note First: This design is for battery operated tea lights NOT candles. The materials used are not fire proof! In my last post I shared with you the screen I created from branches to hide our grill from view. 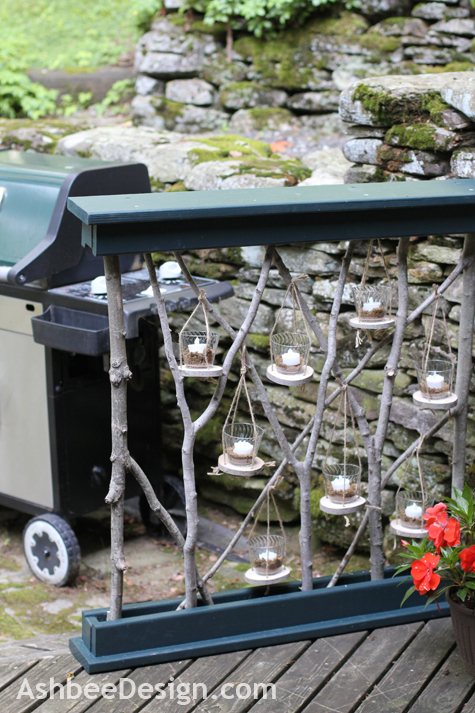 My goal wasn't to completely obstruct the view but to provide a visual focus in front of the grill so that one's eye would rest on the beauty there and not the ugly grill beyond. 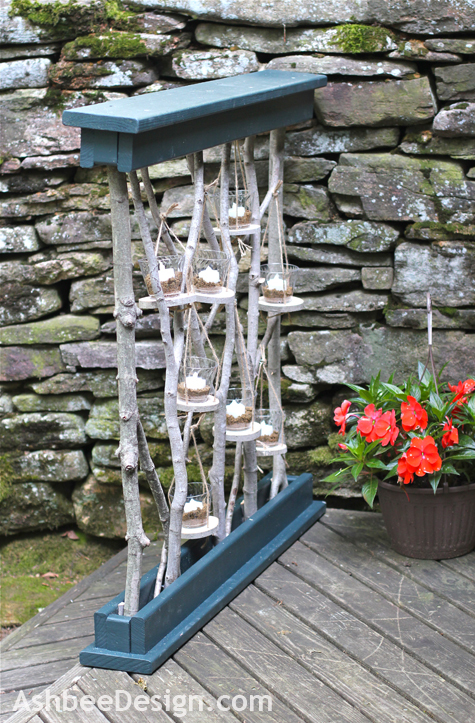 In the process of creating this screen I found that I preferred smaller branches more widely spaced. That created a conundrum because it allowed more of the grill to show. 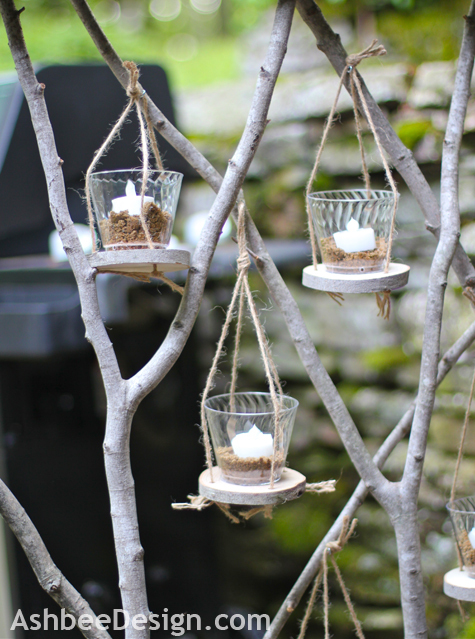 Immediately the thought of hanging little lanterns in the spaces came to mind and I proceeded with the plan. The sticks used in this project, while recently harvested from downed trees, aren't green and will become less green as time passes. I knew the solution needed to be for battery operated tea lights. I had purchased a supply last year to place under the spooky wispy ghosts I create for Halloween and learned then that they are readily available because of the wedding industry. All different types are available affordably from Amazon. I already had the plain flickering type and they worked beautifully for this project as well. 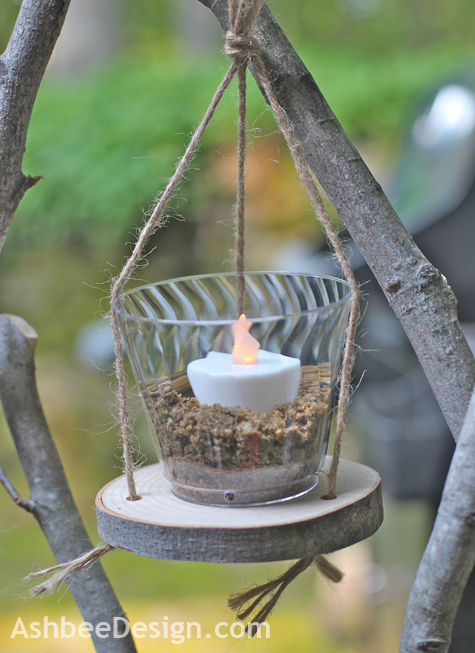 Using branch slices, plastic cups, jute, sand and tea lights I created a group of tiny lanterns to hang in the spaces of the branch screen. I'll share the process below but first some photos. 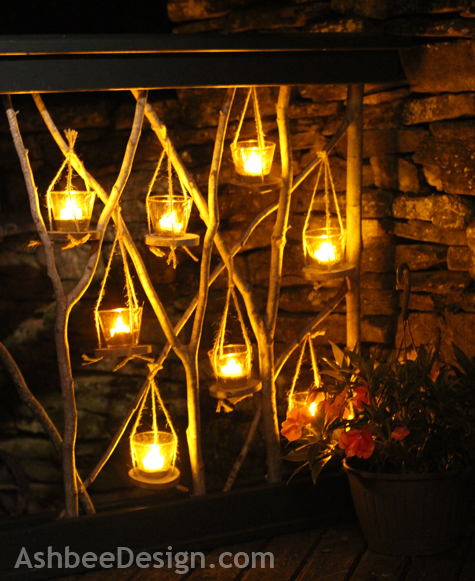 The lanterns can also be hung elsewhere around a garden or patio for a festive evening party. You don't need the grill screen to make and use them. 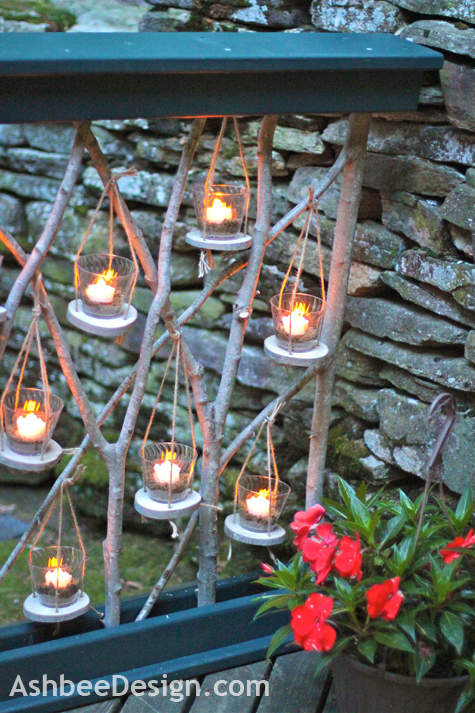 These little lanterns are easy and inexpensive to make and applicable to many situations. Go for it! Give them a try! And visit again to see my next idea for the spaces in the screen. 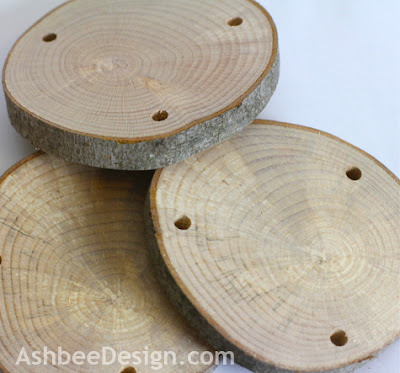 Cut tree slices from a log - one for each lantern - about 4" in diameter and 1/2" thick. I used a band saw and a maple log out of the wood pile. Tree slices can also be purchased from craft retailers and online if you haven't got a band saw or a log pile! Drill three holes (about 3/16") into the slice equally spaced around the edge, about 1/4" in from the edge. Drill 3/16" holes into the side of the cups. My thought here is when I have these outside with the white stone stacks, I want them to be able to drain. I don't have the stones yet so I haven't tested this theory. By using the drill on a slow speed I was able to drill drainage holes with out cracking the cups. 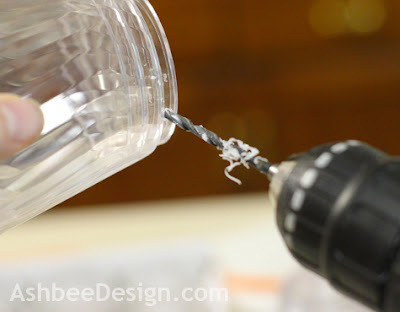 Hot glue the plastic cup to the tree slice. Nothing fancy here, just put a ring of hot glue on the cup and place it into the middle of the tree slice. 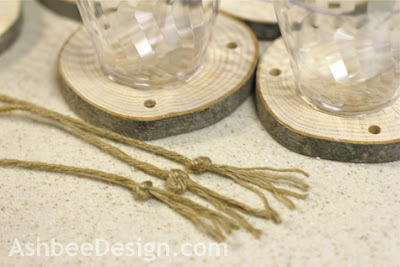 Cut jute, three strands for each lantern and tie a double knot at one end. I also frayed the ends for the rustic look. Thread each of the jute strands through a hole in the tree slice, gather them at the top and knot together. 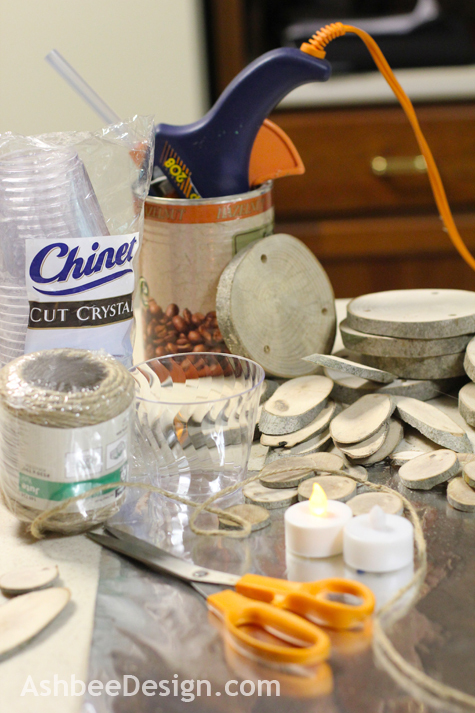 I added about 1" of sand to the bottom of each cup for added weight and to hold the tea light in place. Other materials could easily be substituted in here for a different effect. 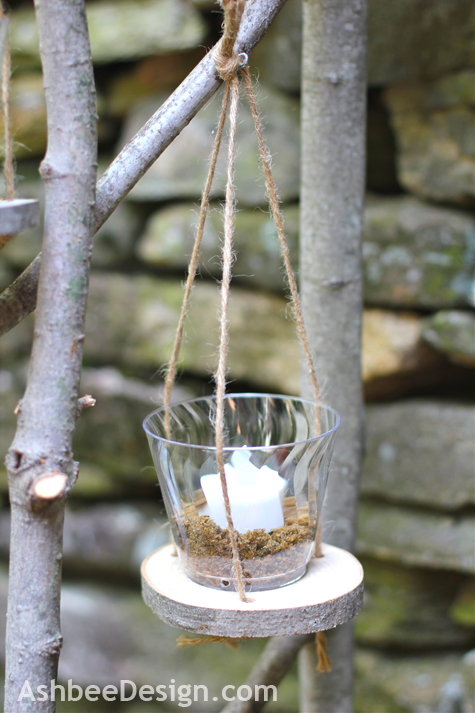 Add the tea light and hang the lantern! Then make a whole bunch more! A little side note here: Notice that stone wall behind the branch screen? I built that 33 years ago while pregnant for my first daughter! Our home is a passive solar berm house and backed into the hillside so retaining walls were a nessecity. Here in New England stones are a free and plentiful resource so I started stacking. This is the second of many, many walls I have built over the years. (See the post about my most recent wall here.) The first wall I built was a learning wall meaning full of experiments and mistakes. It hasn't lasted through the decades and I have robbed it of stones for other projects. That is absolutely incredible!! This is such a unique and lovely project and your tutorial was fantastic. :-) Thank you so much for sharing this with us at Inspiration Friday this week! Thanks for the comments Vanessa. And thanks for hosting. Keeps giving me places to share. P.S. Have you ever heard of hometalk.com? It is an awesome site for sharing projects like this and we would love to have you post it over there! :-) Let me know if you do! I love your style! Love the screen you created too. Welcome! I plan to keep posting, although this week has been a busy one! Thanks for visiting and subscribing. 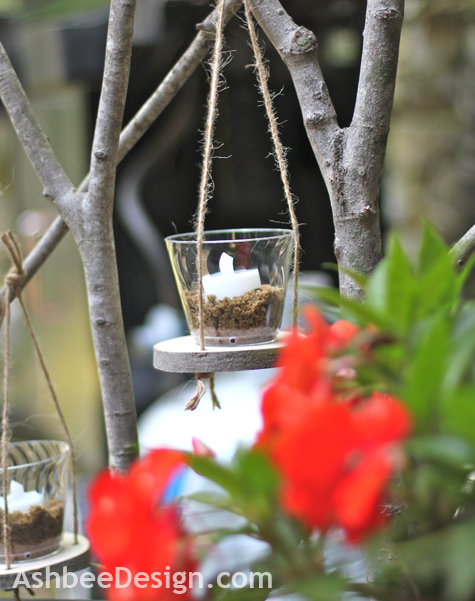 Already your screen was AWESOME... now it's even more AWESOME with these little tea light lanterns! LOVE IT!! Thanks Christine, I am liking ideas that provide a base for seasonal décor. This fence works well for it. Wow - that is gorgeous. I LOVE the way it looks on your fence. Nice job!! Pinning this. Thanks for linking up at Romance on a dime's TIOT party!! Love the fence and the candles! You are right - quite romantic! They didn't last well. Hot glue doesn't seem to be a good outdoor solution. Liquid nails maybe?It's flexible.